While spending time with the Innokin CORTEX and iSub S for my last vape gear review, Julia plopped down a brand new Innokin Coolfire IV Plus Storm Edition and told me that this would be my next review project. Since I was already working on a review for Innokin’s Coolfire IV Plus I decided to abandon (merge?) that review and spend time on the Storm Edition. After all, the Coolfire IV Plus and the Storm Edition are basically the same device. The color, white, and the iSub G tank make up the total difference between the two starter kits. At MyVaporStore the price of the Storm Edition is a couple of bucks less than the other starter kit. $64.50 for the Coolfire IV Plus and $63.95 for the Coolfire IV Plus Storm Edition. The iSub APEX sells for $23.95 while the iSub G retails for $21.95, which is the primary reason the Coolfire IV Plus Storm Edition is a little less. I do have some questions as to why Innokin switched out the APEX for the G for the Storm Edition, but hey, that’s their choice, not mine. It will remain a mystery in this review, feel free to speculate in the comments. The Coolfire IV Plus comes in four colors; Blue, Black, Silver and Red. The Storm Edition comes exclusively in White, with black accents. The color of the iSub G that comes with the Storm Edition is also white, so it’s a matched pair kit, while the iSub APEX is stainless steel in color, and materials. The choice of tank you or I might prefer, the iSub Apex vs the iSub G is a matter of personal preference, but I do like the Top-Fill of the Apex. The PRISM Flavor+ Boost is also a feature of the Apex and the new iSub S, featured in the CORTEX kit, but is absent in the iSub G. Neither Coolfire IV Plus features Temperature Control technology, which I found surprising. I will go over the differences in the two tanks in a bit, but for now I’ll focus on the Coolfire IV Plus, both ‘color’ editions and the Storm (white) editions. While the Innokin Coolfire IV Plus is available in two Starter Kits it is important to note that the device is available as a standalone device. Whether or not you’re looking for a “kit” or the device by itself, this section of the review will discuss and highlight the Coolfire IV Plus as a standalone. The Coolfire IV Plus can output up to 70 Watts and can fire down to 0.1 Ohm with a long-lasting 3300mAh built-in battery. The device is curved to fit into the hand of just about every Vaper, from someone my size to Kiera’s petite size. The device features an ergonomically located power/fire button, on the front side of the Coolfire IV+ near the top of the device. While holding it in your hand you’ll find your firing finger gravitates to that position naturally. The Coolfire IV Plus charges by way of a microUSB cable and port. There are the usual onboard advanced safety features of most well-made modern devices, including overheating protection and over-discharge protection. The Coolfire IV Plus may be compact in size, yet it is also powerful and quite durable device. The colors offered in the standard Coolfire IV Plus are deeply saturated and look surprisingly good, while the Coolfire IV Plus Storm is equally beautiful with its stunning white finish on the body (and the tank). As I indicated above, the Coolfire IV Plus carries more wattage than the standard Coolfire IV (40W vs 70W), and as yet not adopted Temperature Control technology. While I have no real information about why the mod lacks temperature control (both tanks offer Ni200 and Ti coil heads, so they are TC compatible), I can venture to guess. Nearly all new devices coming from the leading manufacturers, as well as many smaller ones, include some sort of TC technology, despite this new technology’s slow adoption rate. Many Vapers consider the ‘annoyance’ of having to learn how to use yet another layer of vaping technology, and have decided that it just isn’t worth it, yet. While Innokin was hard at work developing the CORTEX with the IKANI chip, Innokin must have felt that there were plenty of customers that would love to own the Coolfire IV or IV Plus without needing TC tech onboard. What I am hearing from several vendors it now looks like a good decision; the Coolfire IV Plus is selling very well, as did the earlier 40W Coolfire IV. All major Chinese manufacturers have been busy releasing dozens of new devices and even more tanks these past few months, including Innokin. Innokin has released the Coolfire IV, then just a couple of months later bumped the wattage to 70w and put out the IV Plus. 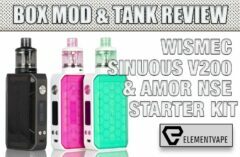 In addition, Innokin has released the Endura T18, the Endura T22, the Disrupter series, and an assortment of tanks. They’ve been very busy. I have no doubt whatsoever that a Temp Control Coolfire IV or V isn’t far behind. Whether it will use the IKANI chip or not, I cannot say, but I wouldn’t bet against it. I’m all for innovation, it’s the trickling out of various products with quick updated versions that sometimes gets to me. If Innokin releases a Coolfire IV 100W version before a TC version, well, I’ll be unhappy about it. Wattage can be adjusted from 6.0 – 70.0 Watts in .5-watts increments. I found that while most VW mods today will increment up the scale by .1-watt the Coolfire IV Plus is staying with its older .5-watt, and again, I’m surprised by this. Surely a board with the ability to increase or decrease wattage by .1 increments would not add to the cost. Mainstream Vapers, those that are only looking for a better vape experience probably don’t care about how finely tuned they can adjust the wattage, so .5-watts is probably fine, though it lends credence to the whole “planned obsolescence” strategy that many manufacturers plan for. Lastly, 6.0-70-watts is fine, though most, including the CORTEX, now run the gamut from 1-watt to the max wattage. This .5-watt increment and 6-70w range seems more like late 2014 technology than late 2015. Though it is worth mentioning the the Coolfire IV Plus retails for just $44.33 (without a tank). That $44 price tag is okay for what you get, but there are more feature-rich devices on the market for the same, or lower, price. Voltage can be adjusted from 2.0 – 7.5 volts in .1 volt increments. Not much to say here, if there are many Vapers left that enjoy variable voltage they’ll find it here. Personally, this is an option I no longer bother with. The Red LED and Battery bar will blink continuously when the battery capacity is lower than 3.3V and then the device will automatically power off. This is the time, of course, to recharge the device. Short Circuit/Atomizer Protection protects the device against shorted atomizers and will stop the unit from functioning in unsafe conditions. A common, but welcome feature. The Innokin Coolfire IV Plus features an automatic, real-time ‘atomizer Ohms detection’ feature. If the resistance of the atomizer is lower than 0.1 the Ohms bar will blink and the Innokin Coolfire IV Plus will not turn on. I would imagine this would be a problem only for Vapers using RDA/RBA’s with their own, hand built coils. What I find a little confusing here is that while the Coolfire IV Plus can fire down to 0.1-ohms, without temperature control technology in the unit there isn’t much reason to go below prebuilt coil heads rated at 0.3-ohms. I just can’t see advanced vapers attempting to go down to 0.1-ohm with Kanthal wire in an RDA using a Coolfire device. As I mentioned, the Innokin Coolfire IV Plus is recharged with a microUSB cable. When plugged into a power source the Innokin Coolfire IV Plus can also be used while charging, a handy feature for those of us that are in front of our computers all day long, but again, an expected feature today. When the Innokin Coolfire IV Plus is off it will remember the current voltage or wattage settings you have set the device to, and it will retain those setting when the device is turned back on. Very nice feature to have. The Innokin Coolfire IV Plus 510 threading is compatible with all standard 510 tanks & RDA’s/RBA’s including older Innokin clearomizers like the iClear16, iClear16B, iClear16D, iClear30, iClear30B, iClear30S and the Gladius-M should you still be using them. If you’ve stocked up on older Innokin clearomizers you’re in luck, but Vapers with newer tanks and RDA’s will find the 510-connector very cooperative as well. I couldn’t find a single tank that did not make a solid connection to the Coolfire IV Plus. The Innokin Coolfire 4 Plus constantly monitors the battery voltage and will automatically power it off if the battery becomes over-discharged. Puff Counter – Like many, or most, devices today, the Coolfire IV Plus does puff counting. Honestly, have you ever used the puff counter? I haven’t. The Innokin iSub APEX is the updated version of the first iSub and iSub G tanks. The Innokin iSub APEX has been created to be the best tank for mouth-to-lung vaping, and for lung hit vaping, depending on the coil head you use. The Solid Spin Top Fill System refills fast and clean, the raised adjustable airflow minimizes leaking and maximizes performance, as long as you remember to always close off the top-fill slots before you start vaping. If you forget to close off the fill slots you can expect some massive leaking. This sleek 100% Stainless Steel body and Glass tank have been engineered for durability as well as outstanding flavor and vapor production. The Innokin iSub APEX is compatible with all 2.0Ω, 0.5Ω and 0.2Ω iSub Coils which are made with 100% Japanese organic cotton that provides fast wicking and excellent flavor. The Innokin iSub APEX has (2) drip tips (stainless steel and glass) included as well. The stainless steel drip tip has a Delrin insulator which prevents the drip tip from overheating. Like the newer iSub S found in the CORTEX kit (and as a standalone tank), that insulator works extremely well. Innokin’s Prism Flavor+, boosts flavors to bring out the best in every e-liquid. The patented Prism convection airflow system draws in air through the dual, raised, adjustable intakes slots, then down into the heated outer chamber and then back up through the vaporizer coils, delivering excellent flavor and also minimizing a leakage issue. The interior design of the Innokin iSub APEX Prism system focuses and enhances e-liquid vapor, delivering an a vape even advanced vapers will enjoy. The Stainless drip tip has its own adjustable airflow valve as well. The tank airflow has also been moved to the top of the tank to reduce the chance for leakage. This tank utilizes the Innokin ‘No-Spill Easy Swap’ Vertical Deep Coil System. Easily replace the coil without making a mess. I like this APEX tank, and keep on in rotation all the time. The iSub G is also a very good tank, though I like the Apex, or even the iSub S, better. It’s made with 100% stainless steel and tempered glass. The coil heads use 100% Japanese organic cotton and produces excellent flavor and vapor. It’s 3.8mL capacity is larger then the iSub Apex’s 3mL capacity and is probably the biggest selling point. The iSub G, like the other iSub tanks, are good Lung Hit tanks. The coil heads in the iSub G standalone box include two 0.5-ohm coil heads, both Kanthal. Coil replacements however, are available in 0.2-ohm Kanthal and a 0.5-ohm Clapton coil head. Nickel coil heads in 0.1 and 0.2 ohms, and there is a Titanium coil head rated at 0.4-ohm. Naturally, if you’re using the iSub G or the APEX, with the Coolfire IV Plus stay away from the Nickel and Titanium coil heads. 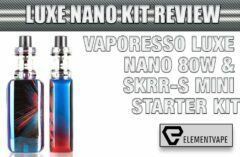 As discussed above, this Starter Kit is an excellent kit for vapers not looking to concern themselves with Temperature Control or Ni200 and Ti coils. With it’s 70W of output and high amperage that allows for coils to fire as low as 0.1-ohms, this is kit, or device, that is very much worth the cost. My girlfriend loves her Coolfire IV Plus with the APEX tank and is satisfied enough not to bother looking at other devices. While the iSub G tank is a decent tank, I would rate the Starter Kit higher had it come with a white APEX and the new iSub S, the flagship iSub tank. I don’t believe many vapers will be able to tell the difference in performance between the APEX and iSub G, especially when they won’t be using it for Temperature Control features. The combination of an exclusive white finish on the device and the iSub G does give the Storm Edition an edge in looks. Other than presentation, and the different tank, the Storm Edition is no different than the Coolfire IV Plus with the APEX tank and four color finishes. 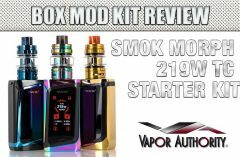 If you’re looking at the Coolfire IV Plus as your next device I say definitely go with one of these Starter Kits, unless you have plenty of tanks already. The Coolfire IV Plus will push any current sub-ohm tank well, so if you’re happy with your Kanger Subtanks, or Freemax, Horizon, or any other tank, then pick up the standalone version. On the other hand, if you really want the white color go with the Storm edition, you’ll like it. If you want a nicely matched tank and don’t care about the exclusive white version, then any of the four color versions with the APEX tank will be a fine purchase. And that, dear readers, is a wrap.